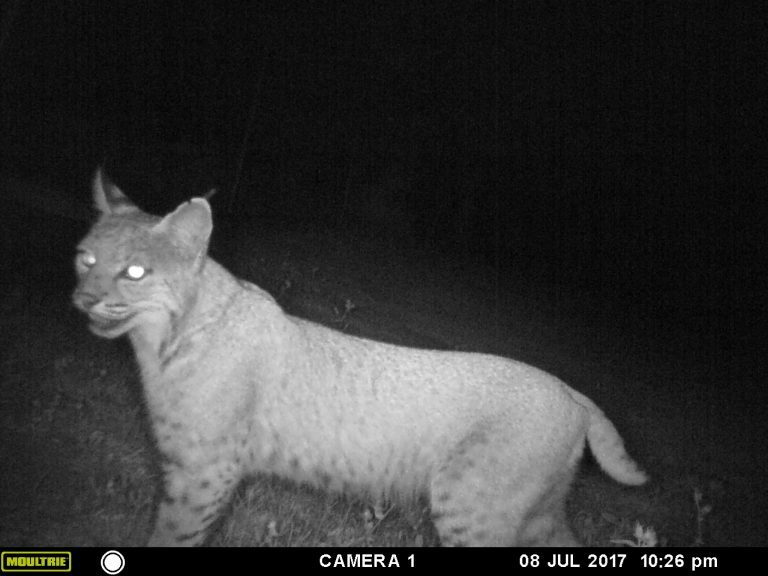 A bobcat prowls the soccer field at the Upper Campus, shifting its gaze late at night at any slight crunch of the brush. 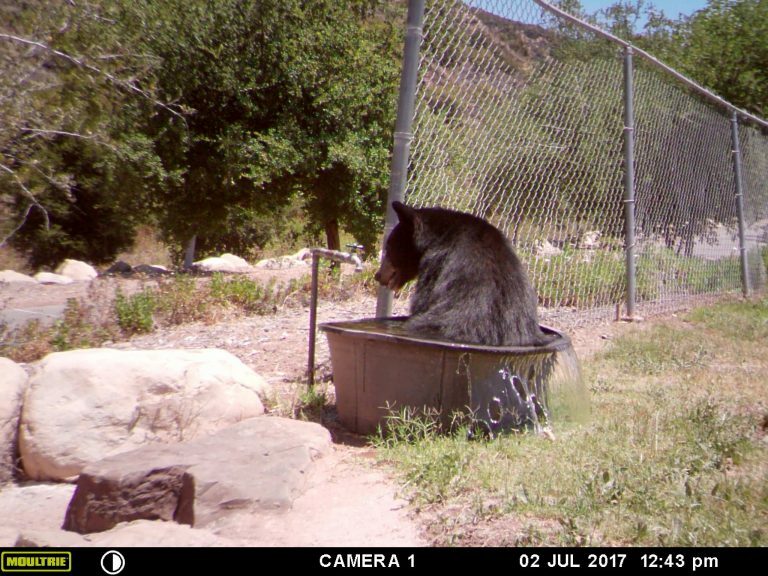 A fully grown black bear plops into a water trough at the nearby baseball field to cool off after an active, hot summer day. A young deer casually strolls up to a gate on a dirt road that doubles as the high school cross country course, sniffing the flowers sprouting up alongside the road. With the large number of noteworthy animals that call the 195-acre Upper Campus home, you’d think the high school students who live and go to school here were tending a zoo. However, all of these animals roaming what is affectionately known as “The Hill” are part of a different kind of exhibit. Instead of being live in front of smiling faces, they’ve been captured by game cameras set up in recent years by Advanced Placement Environmental Science students. The game cameras add an innovative aspect to the AP curriculum while pioneering a new way to see wildlife on campus. 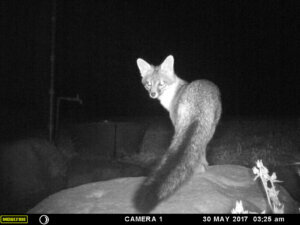 Most who study and work at the Upper Campus will never see half of the creatures captured on the cameras, so these photos provide a taste of what happens in the outdoors when nobody is around and nobody is watching. Last year, the game cameras were a supplementary assignment to the curriculum, but this year they are serving a more vital and science-centered purpose, allowing students to record yearlong changes in the animals that roam campus. Read the complete article on the OVS student journalism website, On The Hill. May 19 – If one of the goals of Outdoor Education is to teach perspective, then the Upper Campus whitewater rafting trip to the Kern River last weekend should earn high marks. 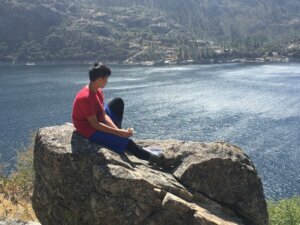 Fourteen high school students and two teachers trekked to the southern side of the Sierra Nevada to tackle the rough water of the Kern and tour the Trail of Giants at Sequoia National Park. Following years of drought and low flows, a combination of heavy winter snow and warm spring temperatures have combined this year to produce a roiling Kern River, so much so that students were initially shocked at how much whitewater they would traverse. Indeed, aided by able river guides the students learned to work as a team, taking three runs down the Kern, each progressively harder than the one before it. Outdoor Education Director Zach Byars, a swift water rescue instructor before coming to OVS, taught the students all about river safety, showing them how to read the water and avoid trouble spots. And he taught them how to have fun on the river, providing a new perspective and a healthy dose of respect for the waterways in our backyard. 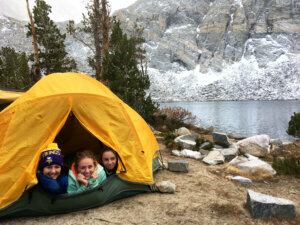 Trip leaders have captured some incredible pictures during spring backpacking and weekend outdoor excursions. 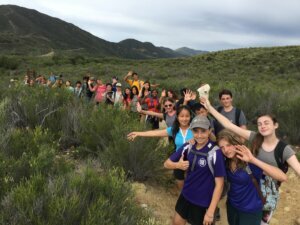 Be sure to visit the website media galleries to view pictures from the Middle School camping trips, the Sespe Backpacking trip, and the San Onofre surf trip. It was windy. It was cold. And, oh yeah, it snowed. But for a group of eight seasoned Ojai Valley School students – all alums of the Lower Campus, known for its vigorous outdoor education program – none of that mattered. 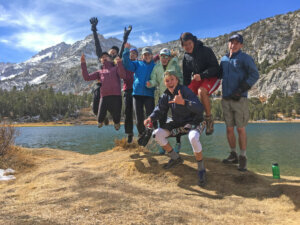 Boldly setting out to conquer the eastern Sierra Nevada, the students traveled up Highway 395 to Rock Creek and then hiked nearly a dozen miles to Gem Lake, elevation nearly 10,000 feet. After setting up camp, some hiked even higher. And they all soothed their sore muscles in hot springs just south of Mammoth. All in all, it was a memorable outing and an excellent example of the reinvigorated Outdoor Education program at the Upper Campus, now under the direction of new history teacher and outdoor education coordinator Zach Byars. Read more in a story by sophomore Caroline Morrow (L15) on the student journalism website, On The Hill, and click here to see a gallery of photos from the trip. In the fall, high school and middle school students venture out for multi-day base camping trips and weekend trips for mountain biking, surfing, rock climbing, mountaineering, horseback riding, and kayaking. On a rocky plateau overlooking miles and miles of the Pacific Ocean, Ojai Valley School students crouched over hardened soil, shovels in hand. With quiet focus, they overturned clumps of earth, creating new homes for plants native to the Channel Islands chain, just off the Ventura County coastline. It was a long way to go to till some soil. But this was not your run-of-the-mill gardening project. 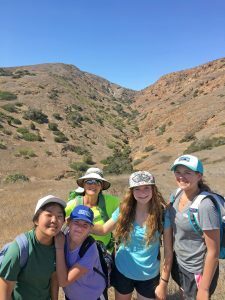 The students, members of OVS’ Advanced Placement Environmental Science class, sailed in February to Anacapa Island in the first of what will be a series of excursions to Channel Islands National Park for environmental education and restoration projects. Fifth graders made the trip in March. This week, middle school students will depart for Santa Cruz Island to continue this field work and the senior class will anchor these projects with a trip in late May. In partnership with the national park, OVS earlier this school year was awarded a $4,000 Hands on the Land grant, part of a national effort to connect students, teachers and volunteers with public lands and waterways. OVS was one of 22 institutions nationwide to receive the grant, which came about through a collaborative process between parents, the park service and the high school and middle school staffs. Funded by the the National Environmental Education Foundation and the Environmental Protection Agency, the grant in coming months will be used by students and teachers on both campuses to access the islands and use them as living laboratories, tackling projects including working on-site in nurseries, removing invasive vegetation, and gathering and compiling plant restoration data. “This grant rapidly advances our goal to partner with Channel Islands National Park on long-term restoration and research projects,” said AP Environmental Science teacher John Wickenhaeuser, who as the school’s director of technology and sustainability spearheaded the grant-writing effort. 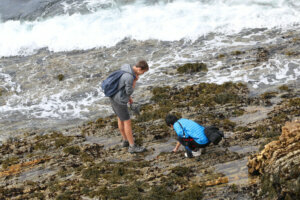 On the school’s first visit to the islands as part of the grant, students embarked on a mission to learn about Dudleya, a plant native to Anacapa Island, one of the five islands that make up Channel Islands National Park. The plant, like many others native to the island, has been crowded out by invasive ice plant, which was brought to the island in the mid-20th century for landscaping and erosion control. 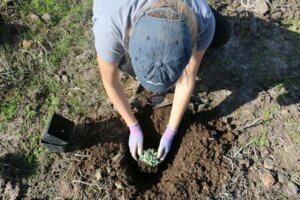 After hours of education and labor to transplant the Dudleya, more than 100 new plants were in the ground. Despite the hard work, students were enthusiastic about the project – especially with the added benefit of working and learning outdoors. Lower Campus parent Annie Little, a wildlife biologist with the U.S. Fish and Wildlife Service, accompanied the AP class to the island. Little spoke earlier this year as part of the school’s Guest Lecture series about her work restoring sea birds, including the bald eagle, to the Channel Islands, and she was instrumental in connecting OVS to the current service project. Not only will the grant provide great opportunities for students to learn about the islands and their ecosystems, its objectives dovetail nicely with the AP Environmental Science curriculum and advance the school’s long-standing commitment to hands-on learning. Monique Navarro, education coordinator for Channel Islands National Park, couldn’t agree more. Moreover, she thinks the visits could help ignite in some students a passion to pursue environmental education and activism in the future. The grant funds will be available through the end this school year. 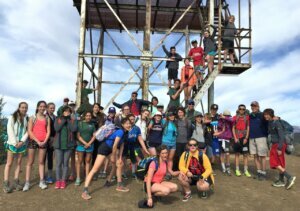 Future activities include a fifth-grade trip to Anacapa Island, a middle school backpacking trip to Santa Cruz Island, and a senior trip to Santa Cruz Island. While school officials ponder future uses, the focus will remain the same. 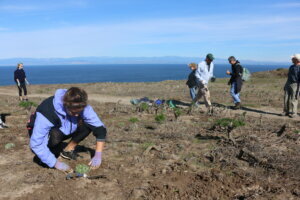 On the windswept plateau at Anacapa Island late last month, senior Ally Feiss worked with several partners to scoop out the stubborn earth and plug in Dudleya, creating in about an hour a field of light-green succulents, the color of green beans, that had not been there previously. Afterward, students worked in pairs to lug bulky water jugs from plant to plant, giving each of the new island natives a long drink. Indeed, on this little island, the OVS students made a big difference – strengthening the habitat for native species and paving the way for future restoration work. 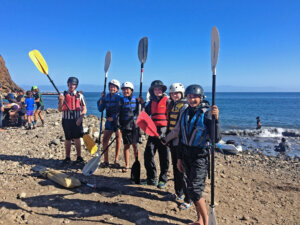 Click here to see photos from the 5th grade trip to Anacapa Island in March. 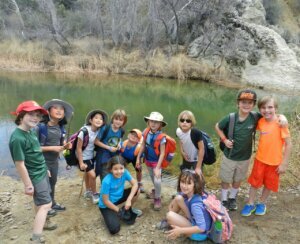 February 1 – Students in grades K-8 celebrated the end of the first semester with traditional class hikes into the nearby Sespe Wilderness last week. 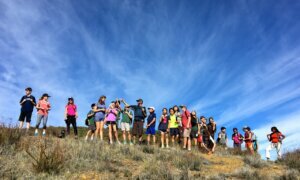 Elementary and Middle School students trekked to and from destinations such as Piedra Blanca, Lookout Laura, Gridley Trail, and more. On the heels a recent rainstorm, students found swimming holes and creeks running in the Los Padres National Forest and enjoyed beautiful sunny weather during a full day of hiking and exploration. September — If you’re looking for a definition of experiential education, look no further than the sixth grade science classroom at Ojai Valley School. 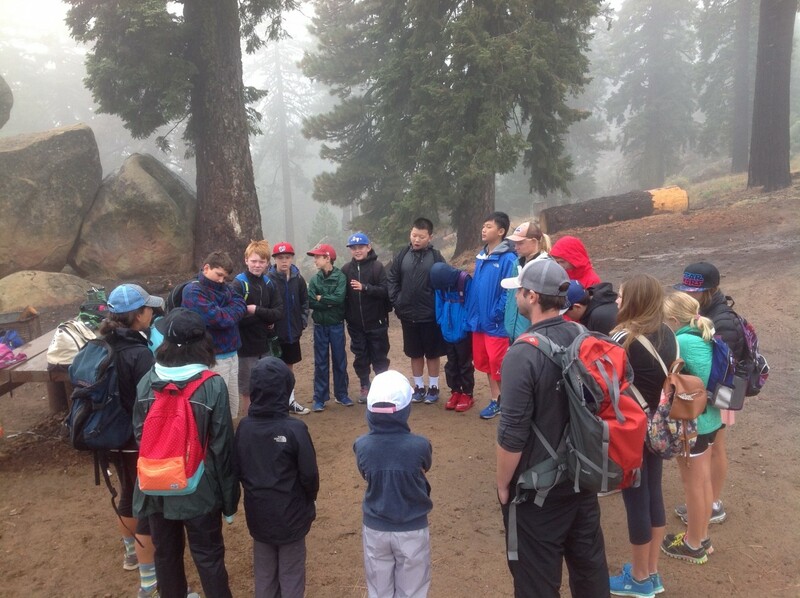 We take integrated hands-on learning to a higher level by leading students on an exploration of the local watershed, which began this week as the sixth-graders ventured to Reyes Peak on a rainy morning to see first-hand how water enters our local environment. “The whole valley is our classroom — and our playground,” sixth-grade science teacher Dustin Vail told parents at Back to School night. 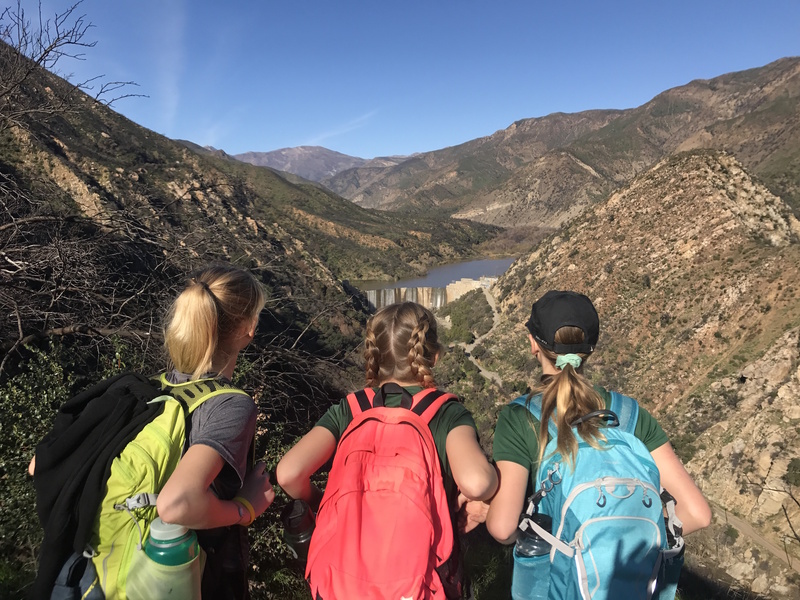 Indeed, the watershed project supplements the earth science curriculum as students participate in numerous field trips to the Los Padres National Forest, Matilija Dam, Ventura River, Friends Ranch citrus packinghouse, local wastewater treatment plant, and more. The watershed study is complimented by the language arts reading list, which includes the Newbury Award-winning young adult novel “Hatchet” by Gary Paulsen. Under the guidance of Vail and teachers Ryan Lang and Vanessa Herrera, the students practiced survival techniques they learned while reading the story of thirteen-year-old Brian Robeson who faces life or death in the Northern Wilderness. This blend of earth science, literature, history, and outdoor education all combine into an integrated exploration of the environment as part of the sixth-grade curriculum.